Is ecstasy a problem for you? Ecstasy is a drug made from different chemicals. It can contain both amphetamines and some hallucinogens. Amphetamines are stimulant drugs which mean they speed up the brain and the central nervous system. Hallucinogens are drugs that can cause people to see, hear, feel or smell things that do not exist (to have hallucinations). People who make ecstasy often mix or cut the substance with other things to make the drug go further. Some substances in the tablet or powder can have unpleasant or harmful effects. It is difficult to tell what the drug actually contains. ​What ecstasy does to you depends on how much you take, your height and weight, your general health, your mood, your past experience with ecstasy, whether you use ecstasy on its own or with other drugs and the composition of the drug. Tap a body part to learn more of the effects ecstasy places on your body. The effects of ecstasy can start with an hour and typically last up to about six hours. Some effects may continue for up to 32 hours. feel paranoid (fear that others want to hurt you). impair your capacity as a parent/primary carer of children. 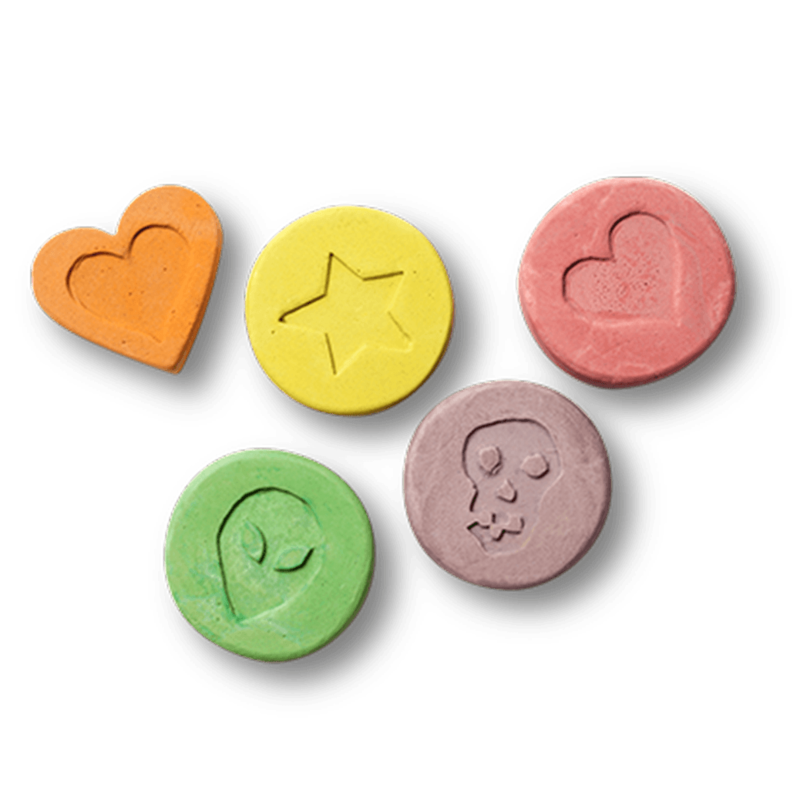 Ecstasy is made illegally and is sold as small tablets in various sizes and colours. It can also come in powder form to be inhaled through the nose (snorted). What are the hangover effects? If ecstasy is used in higher doses, the user may experience a risk of developing a mental health disorder such as depression and psychological distress. Long term effects may include damage to some of the body’s major organs (liver, heart, brain). If you use ecstasy often and for a long time you may also develop a tolerance to the drug. Tolerance means that you must take more of the drug to get the same effects you used to have with smaller amounts. It appears that you feel more unpleasant effects when you use more ecstasy. People who use ecstasy sometimes take other drugs at the same time. Sometimes they do this to increase the pleasurable effects. Sometimes they use other drugs at the same time to cope with some of the things ecstasy does to the body. Some people take drugs such as tranquillisers, alcohol or marijuana to help them sleep. Taking ecstasy with other drugs such as speed or LSD can cause a psychotic reaction (psychosis – a serious psychological problem where you hear voices, imagine things, or fear that others want to hurt you). Taking ecstasy and alcohol raises blood pressure and body temperature and increases the chance of dehydration. Some people have died after having a very bad reaction to ecstasy. These deaths are often caused by the body overheating and dehydrating. Dehydration can be prevented by drinking plenty of water. Doctors recommend that you drink 500ml per hour if you are moving around (eg dancing), and 250ml per hour if you are not moving around. Some deaths have occurred by over-hydration (i.e. drinking too much water). If the person has been mixing ecstasy with other drugs, tell the NSW Ambulance paramedic exactly what they have taken. Paramedics are there to help. Generally paramedics don’t involve the police unless there is danger to themselves or other people/children, someone dies, or a crime (such as violence or theft) has been committed. It is best not to use any drugs during pregnancy. Most drugs have some effect on the unborn baby if the mother uses them while pregnant. Inform antenatal staff of cannabis use and attend regular antenatal checkups. It is possible that using ecstasy when pregnant increases the risk of miscarriage. The use of amphetamine-­like substances such as ecstasy during pregnancy has also been associated with delayed development and subtle abnormalities in newborn babies. It is possible that if a mother uses ecstasy while breastfeeding the drug will be present in her milk, and may have adverse effects on the baby. Using ecstasy is illegal. If you use, sell or give ecstasy to someone else and get caught, you could face substantial fines and penalties including a prison sentence. Ecstasy can make you feel more confident when you drive. This can make you take dangerous risks and have accidents. It is illegal to drive under the influence of drugs, including ecstasy as you could lose your licence for a set time or be fined. Anyone under the influence of ecstasy who kills or injures another person while driving can be sentenced to a term in prison.